The stomach is a dilated part of the GI tract that produces acid, which helps with the initial breakdown of proteins. The small intestine extends from the stomach to the colon and serves to further breakdown food into absorbable nutrients. The colon is the reservoir for stool, serves as a water absorber, and is the site for production of certain vitamins by bacteria. There are three major groups of intestinal tumors: lymphoma, adenocarcinoma, and leiomyosarcoma. In general 70% of adenocarcinoma tumors spread, whereas about 30 to 50% of leiomyosarcoma tumors spread. Collies and German shepherds are more commonly affected by the adenocarcinoma and leiomyosarcoma intestinal tumors. Siamese cats are predisposed to developing intestinal adenocarcinomas. Lymphoma has two forms in the intestine: one that is a mass in the intestine and another that has diffusely infiltrated the intestine. The diffuse (entire bowel is affected by infiltration of cancer cells) form causes malabsorption of nutrients. The mass form of lymphoma causes intestinal obstruction or may cause the intestine to rupture. There is no breed predisposition for lymphoma. 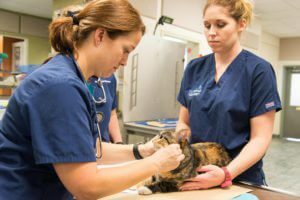 Specialized DNA tests have shown the feline leukemia virus to be a potential cause of intestinal lymphoma in cats. Antibody tests used to detect the presence of feline leukemia viral infection commonly are negative. The primary signs of an intestinal tumor include vomiting, diarrhea, anorexia, depression, weight loss and dehydration (mouth becomes less moist and saliva becomes tacky). Patients that develop infection in the abdominal cavity as a result of rupture of the intestinal tumor become very ill and may have signs of acute depression, vomiting, fever and abdominal pain. Crying, whimpering, unwillingness to lie down or assuming a hunched or praying position (down on the forelimbs and up on the hind limbs) may be signs of abdominal pain. The diagnosis of an intestinal tumor generally is made with abdominal ultrasound; however, abdominal X-rays may also be helpful. In some cases, barium (contrast agent) may be administered orally and then multiple X-rays of the abdomen made to see if the bowel is narrowed from the tumor at the site of the intestinal tumor. Blood work is used to rule out other internal organ diseases. Chest X-rays are done to evaluate the lungs and lymph nodes within the chest cavity for signs of spread of the tumor to these organs. It is important to note that microscopic spread of cancer cannot be detected with any imaging modality. An incision will be made into the abdomen to allow the surgeon to examine the internal organs. The portion of the intestine that has the intestinal tumor is removed. Biopsies are collected from the intestines, liver, lymph nodes or other organs and submitted to a pathologist for evaluation for metastasis. While in the hospital, your companion will continue to receive intravenous fluids, electrolytes and in some cases plasma or an artificial plasma product called Hetastarch. Your companion will be carefully monitored in the intensive care and will be given narcotics to ensure a pain-free recovery. Most patients that have abdominal surgery leave the hospital within 24 to 72 hours. Following excision of leiomyosarcomas in dogs, the overall mean survival time can vary between eight and 21 months. If the bowel is perforated at the tumor site, the patient has an increased risk of death during surgery or shortly thereafter. Due to a lack of well-controlled studies, the benefit of chemotherapy is not known. 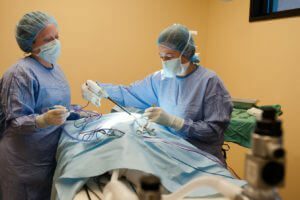 Cats that have adenocarcinomas of the intestine with visible spread of the tumor have a median survival time of five months after surgery; however, with no visible spread of the tumor, survival time doubles to 10 months after surgery. Following excision of intestinal adenocarcinomas in dogs, the overall median survival has been reported to be 10 months. Dogs with metastasis had a median survival time of three months, and dogs with no visible metastasis had a median survival time of 15 months. The value of chemotherapy is not known at this time. Dogs with diffuse intestinal lymphoma generally have very short survival times; however, if a solitary lymphoma tumor in the intestine can be removed and the remaining parts of the bowel do not have extensive diffuse disease, survival is increased to six to nine months with surgery and chemotherapy. In cats, the median survival time is highly dependent on whether the lymphoma is a small cell or large cell (blastic) lymphoma. Patients affected by the small cell lymphoma potentially can survive for one to two years; whereas, the blastic form results in death usually within four to six months. 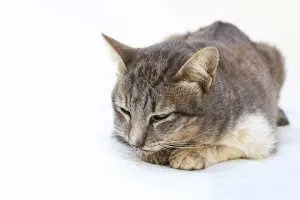 One study showed that about 50% of the cats treated for intestinal lymphoma had complete remission with survival times greater than 650 days; 37% had partial remission and a resulting survival time of 122 days.